Welcome to Ratnagiri! Welcome to most popular Konkan Tourism blog! Tansa wildlife sanctuary is located in Wada, Shahapur and Mokhada Talukas of Thane district. The area of sanctuary is about 320 sq.kms. 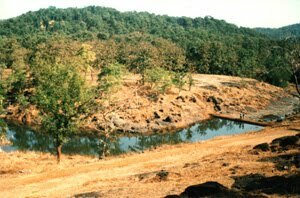 The wildlife sanctuary at Tansa in Thana district comprises the catchment area of Tansa Lake and the surrounding forests of Shahapur, Khardi, Vaitarna and East Wada Ranges in Shahapur tahsil of Thana district. The glittering expanse of Tansa Lake is an eye-catching spectacle and a perennial source of water to wild life in the sanctuary. Being not far from the metropolis of Bombay, the sanctuary bids fair to be of great attraction to its citizens. The vegetation corresponds to the "southern tropical moist deciduous forests". The density of forest ranges between 0.5 to 0.8. Major tree species exist in the area are Tectona grandis (Teak), Acacia catechu (Khair), Terminalia tomentosa (Ain), Adina cordifolia (Hed), Mitragyna parviflora (Kalamb), Pterocarpes marsupium (Bibla), etc.. Bamboo is also found in patches. The forest in the sanctuary provide ideal conditions of harbourage to a variety of birds and animals. There are atleast 54 species of animals and 200 species of birds do exist in the sanctuary. Major wild animals are Panther, Barking deer, Mouse deer, Hyena, Wild boar etc.. The dense wooded forests of Tansa sanctuary are great attraction for visitors from Mumbai, Thane and adjoining region. The lakes of Tansa and Vaitarna are the major source of drinking water supply to Mumbai and Thane. The other tourist places include the famous historical fort of Mahuli, Mahadeo Temple at Tilsa and Plateau of Suryamal. Best time to visit: November to May. By Rail: The nearest railhead is Atgaon on the Central Railway barely 13 Kms from the sanctuary. Khardi is 118 Kms from Mumbai C.S.T..
By Road: From the city of Mumbai the sanctuary is about 95 Kms. and can be accessed by road from Shahapur Town located on Mumbai-Agra National Highway No.3. Log house, Tansa 2 suites D.C.F. Wildlife,Thane. Ascu hut, Tansa 1 suite D.C.F. Wildlife,Thane. Forest Rest house, Suryamal 2 suites D.C.F. Wildlife,Thane. MAP : HOW TO REACH TANSA WILDLIFE SANCTUARY FROM RATNAGIRI? Its nice place to visit. Last month we visited for that i booked Bus Ticket through ticketgoose. Nice blog. Thanks for sharing this nice information. Your very well written post shows this is really beautiful place. Thanks. Glad to know about this Sanctuary. Stocked with rich fauna, Thane also boasts of having Asia's highest panther density. Check out all best 57 hotels in Thane also.